New Design-led Show for Interiors and Construction « Global-Link MP Events International Inc.
On March 11 to 13, the interior design industry will have its first ever trade expo to showcase the latest products, solutions, trends, and concepts that are shaping the world of design. 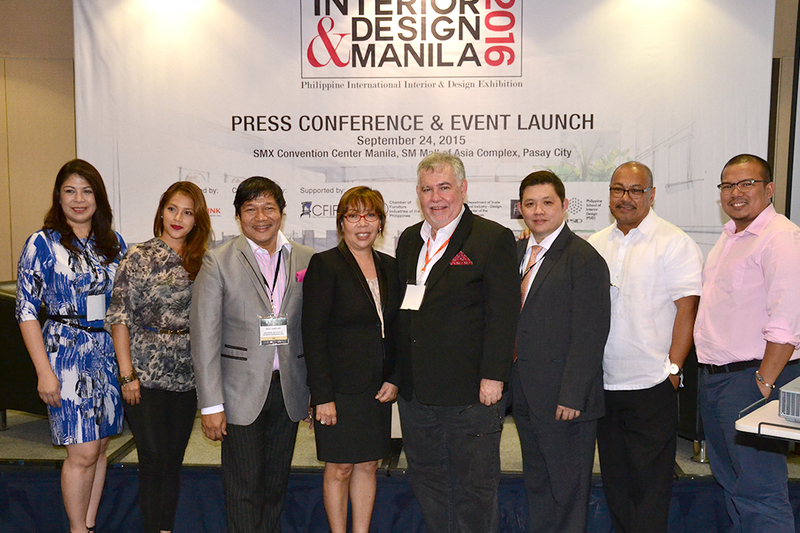 Entitled Interior Design and Manila 2016, this will be held at the SMX Convention Center Manila in MOA alongside the Philippines International Furniture Show where furniture designers will showcase their latest pieces to both foreign and local buyers. The flagship event is a partnership between the Philippine Institute of Interior Designers (PIID) and Global-Link Exhibitions Specialist, Inc.
“The evolution of interior design in the country is very notable. It’s even part of the list of priority courses of the Commission on Higher Education (CHED) as one of the activities that is projected to spur economic growth. But until now, there has not been a platform in the Philippines solely created for this creative industry to showcase their art. That’s why we are launching Interior & Design Manila – to give interior designers and their suppliers a venue to widen their network and explore business opportunities that no other trade show in the country can provide,” shared Patrick-Lawrence Tan, CEO of Global-Link, on why they decided to put up the trade show. Proof is this is the fact that in the last few years, we have seen demand for good design in offices, commercial spaces, residential buildings, hotels, restaurants, recreational facilities, and even houses rise steadily along with the rise in the number of construction projects. At the frontline of IDM 2016’s exhibit are its major sponsors: Pacific Paint (Boysen) Philippines, Matimco Incorporated, Norde International Distributors, Inc. and Wilcon Builder’s Depot. Aside from the expo, IDM will have several event highlights including: Interior Design Plus, a showcase of the top brands of fixtures, fittings and finishing materials; Interior Design Excellence Award (IDEA) Pavilion, where top ten selected professional Interior Designers will showcase never-before-seen concepts and ideas for the modern home; a two-day Continuing Professional Development (CPD) Conference for PIID members; and lastly, a workshop on material application specifically designed for today’s interior designer. For more information about the CPD Conference, you may call the PIID secretariat at (02) 519-3672 or email piid.sec@gmail.com. For exhibit inquiries, contact Global-Link Exhibitions Specialist, Inc. at (02) 893 -7973 and look for Ms. Raileen Yamco or visit www.gesi.com.ph/IDMNL. “IDM 2016 will surely be the best design-led event ever put together. This is where class and taste meet. Definitely a must-attend, must-see show for 2016,” added Jao. IDM 2016 is also supported by Cebu Furniture Industries Foundation, Inc.(CFIF), Chamber of Furniture Industries of the Philippines(CFIP), Pampanga Furniture Industries Foundation, Inc.(PFIF), Philippine School of Interior Design (PSID), and United Architects of the Philippines (UAP).